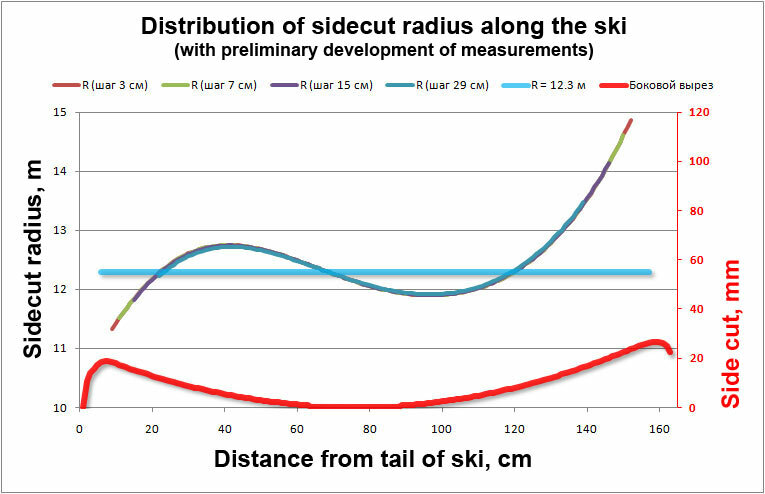 For the last 15 years, ski sidecut radius is usually written directly on the skis next to the precise parameters of the geometry of the ski: the length and width of the tip/waist/tail. The shape of the side cutout is different for different manufacturers and in general is probably connected with the “secrets” of the firm 🙂 Then what does the “radius” mean? I immediately have an association with a circle, that is, with a curve that is completely determined by one parameter “radius”. In this note I will try to understand how much the shape of the side cutout corresponds to the circumference. Sometimes the shape of the side cutout is indicated. Here, for example, skis Kessler, with the declared form of a clothoid (an arc with a variable radius, the closer to the tip, the radius is smaller). Further in the note I will consider only one “race stock”slalom ski Atomic Redster FIS SL 165 cm (2016). More about these skis in the note: Atomic Redster FIS SL 15/16, become stiffer. The thickness of the edges on new skis was 1.25 mm, and they were grinded about 0.25 mm, which gives a decrease in width compared to the new skis by about 0.5 mm. This is to the fact that the width figures written on the ski are still not quite right. I was convinced of this right after the purchase, but I did not record the exact data. 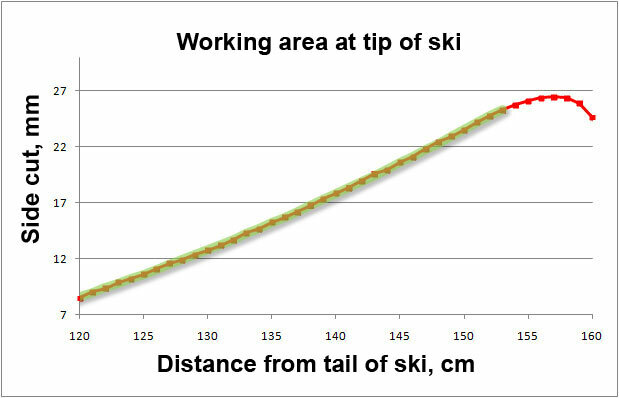 Drawing a circle around three points: the maximum width of the ski on the tip, the width of the waist and the maximum width of the ski on the tail gives a radius of 12.71 m. This is more than written on the ski (12.5 m), although not much. However, measurement in this way will always give an overestimated radius value. 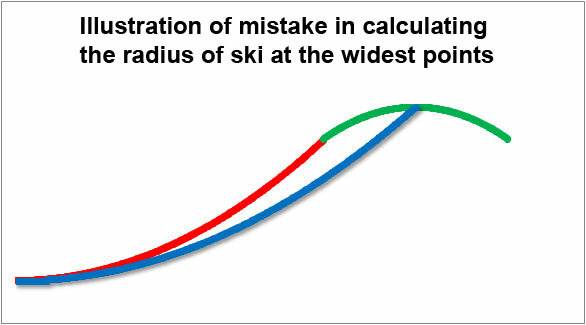 The figure shows a modeled side cutout consisting of a circle (red line) and a “different sign” curve on the tip of the ski (green). It can be seen that the widest part of the tip is located “outside the zone” of the main radius. Therefore, the construction of the circle along the widest part (shown in blue) gives an overestimated radius value. It turns out that the width of the tip and tail is not more than the “transport dimensions” of the ski. Thus, if we assume that the side cutout of the skis is a part of the circle, then in order to calculate the radius, it is necessary to retreat to the center from the widest points on the tip and tail of the ski. So it is implemented in the “calculator FIS”. To calculate using the FIS calculator, you must first enter two digits. First – the length of the ski (you can use one that is written on the ski, I will remind that this is the length of the sliding surface). The second figure is the distance from the tail of the ski to the waist. 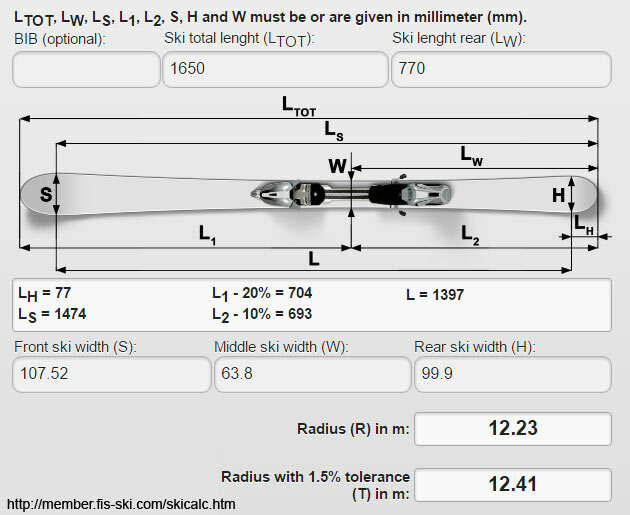 Then the calculator gives out two lengths around the tail and tip, where you need to measure the width of the skis. These lengths are given out on the basis of the FIS experience so as to get away from the widest parts of the skis to the center. In the case of the Atomic Redster FIS SL 15/16 165 cm, this is 9.6 cm on the tip and 1.7 cm on the tail. The radius is 12.23 m, with a tolerance of 12.41 m. The tolerance plays a role in the giant’s skis where the minimum radius is restricted. In slalom skiing there is no such restriction, therefore the figure of 12.41 m is simply “for information”. Figures 12.23 and 12.41 are less than written on the skis (12.5 m), but roughly coincide 🙂 I note that the FIS calculator does not use the “transport dimensions” written on the ski. The side cutout of the ski was accurately measured when searched for the matching of the sidecut shape and the deflection, for more details here: Compliance ski sidecut shape to deflection. Part 2. 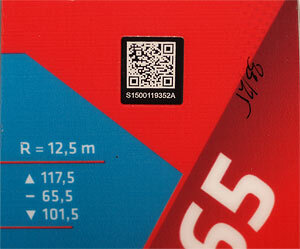 On the sliding surface glued the paint tape, marked every 1 cm, the width of the ski was measured with calipers. The calipers gives a measurement accuracy of 0.1 mm, taking into account that it could not always match into the marking on the tape, the accuracy is estimated not worse than 0.2 mm. It turns out that in the “tail” of the ski, you need to retreat to the center from an inflection of 2 cm, and on the toe by 4 cm. This is the “working” range of the side cutout (8-153 cm, measured from the heel of the ski, only 145 cm from the total length of ski 165 cm), which will be further analyzed. By the way, calculating the radius at the extreme points of this range gives a value of 12.25 m.
It can be seen that the spread of the calculated radius from point to point is very large, besides it strongly depends on the size of the step, in the terminology of the graph. 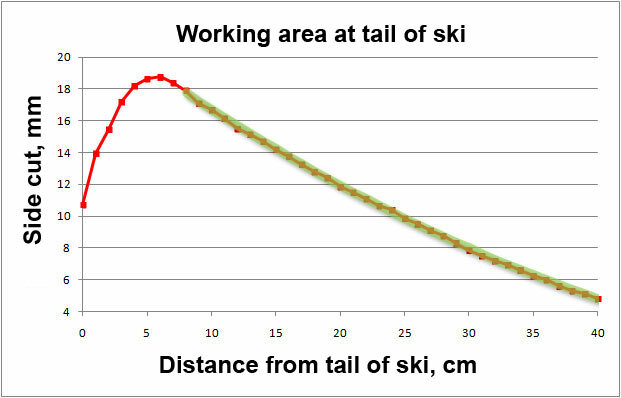 This is due to the fact that the accuracy of measurements of 0.1 mm is clearly not enough to ensure that after a reverse calculation, a smooth dependence of the radius along the length of the ski has been obtained. Something can be said only by the trend lines (shown on the graph as solid curves), a curve of the 6th order (maximum, which gives the standard Excel), constructed with a minimum deviation from the points. Such a curve for a step of 7 cm gives a radius of about 10 meters along the entire length, for a step of 15 cm a complex shape with a radius of about 15 meters, and for the most “wide” measurement with a “pitch” of 29 cm gives an approximate coincidence with the radius determined by the extreme points of the range. If there is still something to show only the trend lines, then it is more correct to first build a smooth curve, passing with minimal deviations through the measured points, and then to process it. This can, as it were, improve accuracy by assuming that the lateral cutout should be a smooth curve. 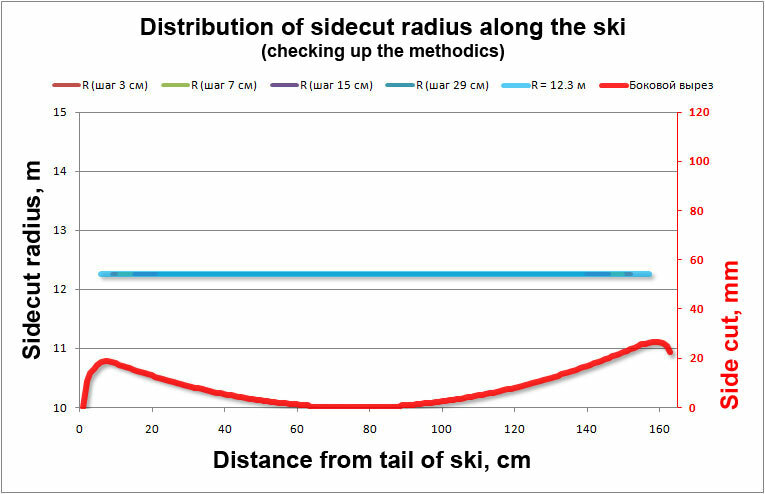 It turns out that the radius of the side cut varies along the length of the ski in a complex way from about 11.5 to 15 meters. The radius calculated on the extreme points of the range also slightly changed and became equal to 12.30 m. But it’s too early to draw conclusions, because the approximation of a real cutout, the shape of which is not known, can show such a “humps” that belong to polynomial, but not to cutout. Now it’s time to check what will happen if to proceed from the fact that the side cutout is a circle. To do this, we need to construct a circle so that it passes with minimal deviations through the measurements. Then to this circle it is necessary to apply the same transformation, approximation by a polynomial of the 6th order. Finally, look at the distribution of the calculated radii of this polynomial. 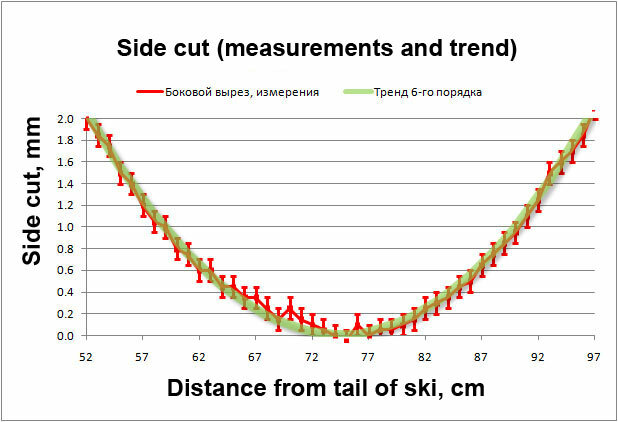 If there are the same “humpbacks”, then in the graph above this is not the distribution of the radius along the length of the skis, but simply the “hardware function”. The circle turned out with a radius of 12.25 m, the center along the length of the ski at a distance of 74.05 cm from the tail, and the circle itself is moved 0.12 mm from the edge. The total deviations of the circle points from the measured ones turned out to be 26% larger than when approximating by the 6th order polynomial. It is seen that even with the generated measurement accuracy of 0.2 and 0.3 mm, the circle remains a circle over most of the range. Only the tails are “capricious.” With “working” accuracy values of 0.05 and 0.1 mm, the radius of the curve along the entire length falls within the range of 12.3 + – 0.5 m. In the range 24-135 cm, the radius is practically constant. That is, you need to be careful only to the calculated radii on the nose and heel outside this range. The shape of the side cutout is not a circle? From the comparison of the reverse counting data for the real side cutout and the “noisy” circle, we can conclude that the real lateral cutout is not a circle, but a curve with a variable radius. Let me remind you that this is not a general statement, but for a ski Atomic Redster FIS SL 15/16 the length is 165 cm, besides not new, after repeated sharpening of edges. In any case, the difference between the circle and the “non-circle” is small, if you attach the ski to the “pipe” with a radius of 12.3 m, then gaps in less than 0.1 millimeter will be visible here and there. This can be the manufacturer’s idea, and because of the error in the manufacture of skis, and due to distortion of the original shape after the “manual” edge sharpening. 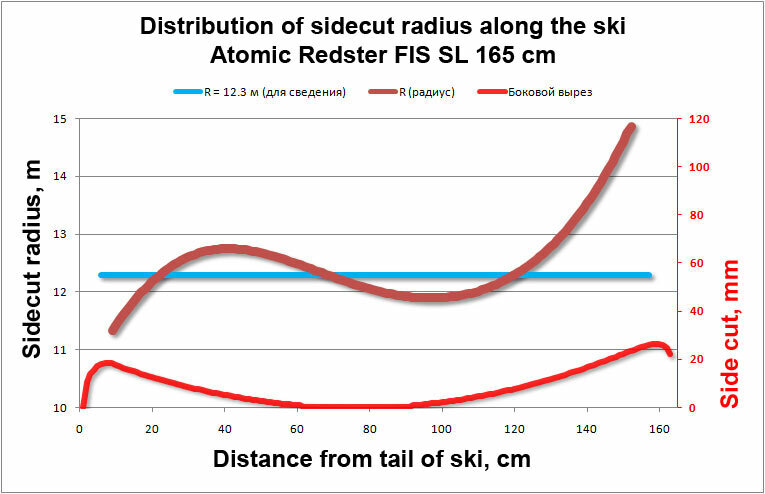 On the shovel of the skis the radius of the side cut is 15 meters, then in the direction to bindings it decreases by 30 cm of ski length to 12 meters, then increases to 12.8 meters and closer to the tail decreases to 11.2 meters. At the same time, most of the skis, 110 cm, fit within the radius range from 11.8 to 12.8 meters (12.3 + – 0.5 m). In itself, the shape of the side cutout is not very interesting. More importantly, how will draw a footprint on the snow edged ski. About this – in the next note Ski sidecut radius and radius of a carved turn. First, and as you write, a ski center of 63.8 millimeters is illegal, since the minimum size for slalom is 65 millimeters of width. – There is not a single ski in the market with a shape in the shape of an arc of a circle. All have an ellipse or cycloid in the front, a straight area in the center and another ellipse or cycloid in the back. This causes two things: one is that the shape of ALL the skis is NEVER the arc of a circle. – The second is that in all the skis, the ellipse or cycloid that define the front and rear forms already vary to each millimeter the radius, closing as we approach the front of the ski. Another question to be addressed is the validity of the “ski radius calculator” of the Fis: It is valid to obtain a geometric data, as I have indicated in the previous paragraph. For the rest, it does not serve abbsolutely FOR NOTHING. With these data, the Calculator of the FIS gives us a radius of 11.02 meters. If you vary the dimensions, changing S and H to 111-65-106 or to 121-65-96, the result is the same. I can guarantee that the behavior of these variables on snow is totally different from the dimensions of the first dimensions. Actual data on the geometric behavior of a ski on snow are ignored and / or unknown by most ski manufacturers. Previous Previous post: How important is the physical condition for slalom in Moscow?